On a recent trip to Chicago, the owner visited an exquisitely restored Gilded Age mansion. A distinct feature of Driehaus Museum was the extensive use of ceramic tile, custom designed and laid as wall covering throughout the formal rooms, influencing the selection of the foyer’s crackle glaze mosaic wall tile. 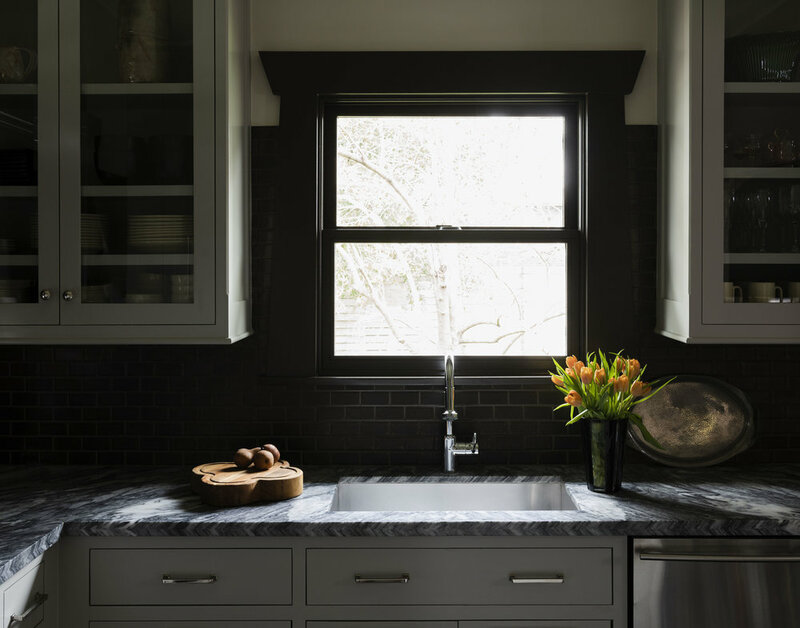 With the use of dark tones and a distinctly veined countertop, the kitchen is at once visually muted to expand the perception of space and activated as a gathering space. Extending the language of an English larder, a generous wall of cabinetry serves as a multi-functional butler’s pantry, appliance garage, broom storage and utility room. A paneled wall inset with beveled mirrors transformed the single bath into a jewel box. Featured on the 2019 East Montrose Home Tour and Art Walk.